Your bird will grab, pull, tear and rip at these cute tentacle arms. 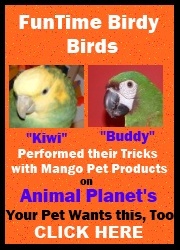 Boredom will never again be in the vocabulary of your feathered friend. This Pinata Octopus Shredder Parrot toy is a must have for any bird especially for those birds that feather pluck or tend to over preen.